Summer festival is in its midst: crostini of cheese and grapes, pears and rocket salad, strawberries with cucumber in fresh yoghurt… Fresh fruits are doing their way into our salty dishes, refreshing them by giving a twist of the season. Melon Risotto is Mauro’s favourite: for the taste, for the colours, for the lightness. 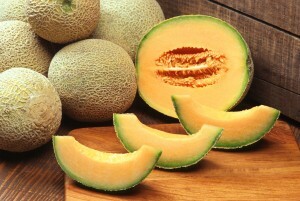 Best to use Cantaloupe melons, which are sweeter and therefore provide a tender flavour and a unique look for the risotto. For serving: short slices of melon, whole parsley leave. Prepare 2-3 liters of stock. When stock boiling, reduce flame to a lower one. In a large pot fry the onion with the olive oil and half quantity of the butter. Stir it on a low flame until it gets golden. Add the rice (two handful per person, plus “two for the pot” as Grandma used to say) and stir it for 3-4 minutes. Add the wine, and let it evaporate for other 2-3 minutes, stirring constantly. Add the melon and 2 ladle of the boiling stock. Let it slowly absorbed by the rice, stirring constantly. Season with salt and pepper, and keep on adding 1or 2 ladle of water per time, until the Risotto is cooked (about 20 minutes). Turn off the fire, add the butter, the Parmesan and the chopped parsley, stir well. Cover the pot immediately and let it rest for several minutes before serving. Serving: in a soup bowl, decorated with slice of melon and a parsley leave.